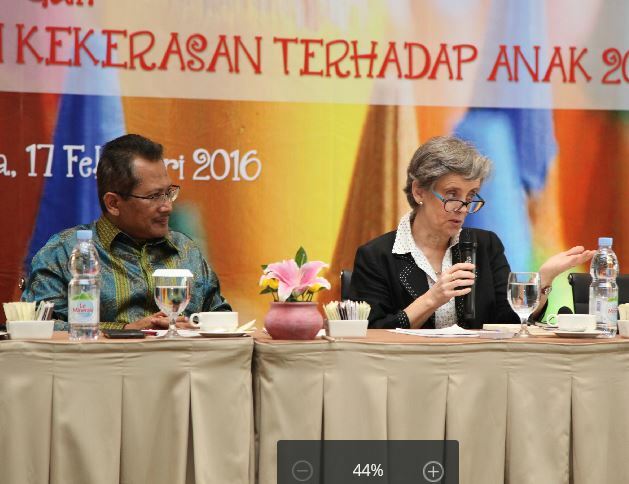 SRSG Santos Pais welcomed the significant progress since her visit a year ago when she had urged Indonesia to be a lighthouse in the region and globally in shaping policies to end violence against children and ensuring their steady implementation. The Government of Indonesia has placed violence against children as a priority concern in its policy agenda and is determined to make significant progress over the years to come. Santos Pais congratulated Indonesia for adopting a National Strategy for the Elimination of Violence against Children and a National Action Plan on Child Protection which together provide a comprehensive framework to prevent and respond to incidents of violence. “Indonesia’s National Strategy recognizes the crucial role of sound data, and comprehensive legislation to prohibit all forms of violence and provide support to child victims, as well as the value of empowering children and supporting families in their caregiving role. These policies need now to be brought to all levels of society, leaving no child behind,” SRSG Santos Pais stressed.